How about a Mayan Gold, a Pink Fir Apple or Mr Little's Yetholm Gypsy? 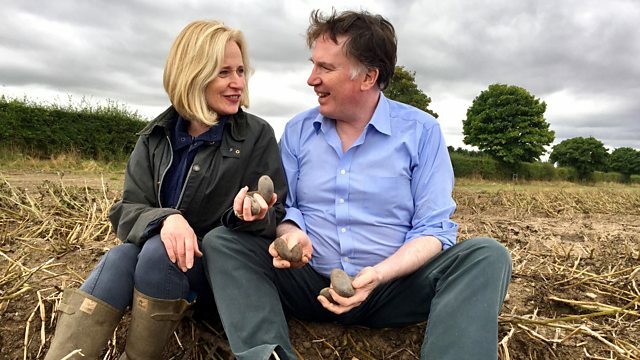 Caz Graham explores the world of the heritage potato. Most of us would be hard pushed to name more than three or four different types of potato but Anthony and Lucy Carroll from Tiptoe Farm near Cornhill on Tweed in Northumbria would argue that we're missing out. They grow around twenty specialist heritage varieties, many of which fell out of fashion decades ago because, despite boasting distinctive flavours, colours and textures, they're much harder to grow and sell than large white round potatoes. They have names that roll from the tongue like Mr Little's Yetholm Gypsy, Red Duke of York and Pink Fir Apple and are increasingly being sought out by top chefs, with the Cornhill potatoes getting pride of place in the restaurants of Jamie Oliver and Mark Hix.